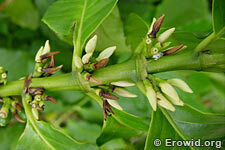 Coffea arabica is a large bush whose beans contain caffeine, theophylline and theobromine. The beans are dried, roasted and ground, and then extracted with water to produce coffee. Coffee is one of the most common psychoactive drinks in the world and has a long history of human use.